This stunning bracelet features 6x4mm oval prong-set stones between polished infinity symbols that is perfect for evening wear and statement pieces. This sparkly tennis bracelet is crafted of fine yellow gold flashed sterling silver and is nickel & tarnish free. It measures 7.25 inches and secures by box and tongue plus a safety latch. FEATURE - Wear this stylish tennis bracelet to enhance your daytime and evening attire. This stunning bracelet features 6x4mm oval prong-set simulated white opal stones between polished infinity symbols that is perfect for evening wear and statement pieces. CRAFTED - This sparkly tennis bracelet is crafted of fine yellow gold flashed sterling silver and is nickel & tarnish free. It measures 7.25 inches and secures by box and tongue plus a safety latch. 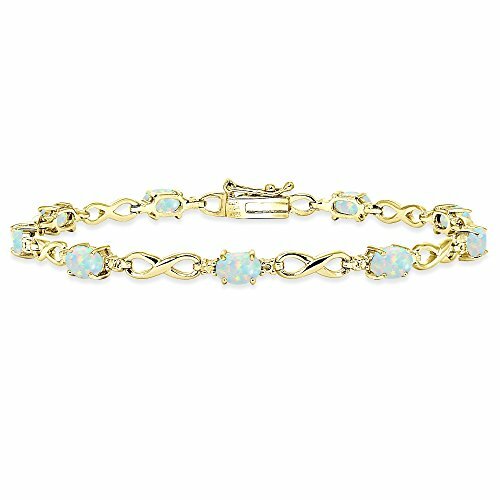 This bracelet in fine jewelry is a great addition to your tennis bracelets and sterling silver jewelry collections. It can be purchased as gifts for women, teens and girls.